This paper aims to study the dynamism and role of the village guardian spirit belief and ritual of the Tai Lue people in Ban Mai Lung Khon, Mae Sai District, Chiangrai Province. The research found that there are three important village guardian spirit rituals in this Tai Lue village: the annual worship of Chao Poh Kham Daeng; the Song Kroh Ban ritual; and Liang Mueang, village guardian spirit ritual. Although the three rituals reflect the transmission of Tai Lue belief in guardian spirits, the study found a certain dynamism in the belief and the rituals. Firstly, there was a physical dynamism in the changing of the location of the village guardian spirit shrine’s from the end of the village to the village center to provide for easier access for the people to the sacred space. Secondly, the name of the northern Thai city guardian spirit and the name of the Sip Song Panna city guardian spirit, Chao Poh Kham Daeng, was adopted to be the name of the Ban Mai Lung Khon village guardian spirit. Moreover, certain components of the ritual were changed to correspond with the change of the village’s social context. Overall, the analysis identifies the dynamism and role of the belief and ritual of the Tai Lue village guardian spirit in the new social context at Mae Sai, Chiangrai, Thailand, particularly the adoption of northern Thai beliefs as integrated with Tai Lue traditional beliefs. This paper aims at examining and analyzing the persistence of Inthakin pillar worship, which today has become one of the rituals performed in connection with the worship of the Chiangmai city guardian spirits. The analysis identifies the characteristics of religious integration between indigenous belief and Buddhism from both concrete components, such as ritual space, ritual offerings, ritual performance, and abstract components, such as belief, social value, and ritual meaning. The research reveals that with respect to both components, more and more of a Buddhist element has been inserted into the Inthakin pillar worship such that the ritual performance is now presented as a Buddhist ritual. The indigenous belief in the city pillar, which was the origin of the ritual, has now been partially replaced in its meaning by Buddhism, leaving only a certain role and meaning of the indigenous belief to persistent in the ritual. The belief in guardian or territorial spirits is a kind of indigenous belief of Tai speaking people and other ethnic groups in Southeast Asia. This paper has two objectives. The first objective is to synthesize the persistence of belief and ritual concerning guardian spirits in the present-day context of Thai society from two case studies. The first case study is the study of the village guardian spirits at Ban Mai Lung Khon, Mae Sai District, Chiangrai Province and the second is the study of the Chiangmai city guardian spirit. The two case studies reveal common findings regarding the dynamism and the syncretism of the belief in guardian spirits. The dynamistic aspect in the first case study concerns the integration of the guardian spirit belief of the Tai Lue, newcomers from Sipsongpanna who settled in Ban Mai Lung Khon, and that of the Tai Yuan, the local northern Thai people. The second case study reveals the syncretistic aspect of the integration between an indigenous belief in guardian spirits and Buddhism. The second objective of this paper is to present an extended discussion concerning the persistence and the dynamism of guardian spirit belief in Thai and Tai societies with respect to several aspects from the observation of the author’s field experience in Tai speaking societies: guardian spirits as Tai indigenous beliefs; the current phenomena of the integration between guardian and ancestral spirits and the spirits of the local heroes in several cases in Thai-Tai societies; and the use of guardian spirit shrines as an expression of Tai ethnic identity in the social context of present-day Thailand. 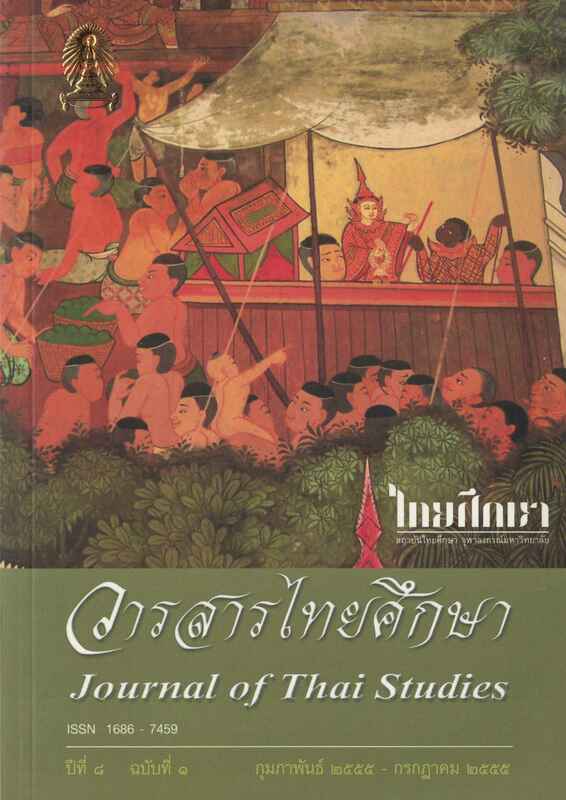 This paper aims at studying the concept and symbols in Bun Paed Muen Siphan Khan at Tha Muang Village, Selaphum District, Roi-Et province. The study indicates that Bun Paed Muen Siphan Khan is an invented ritual based on the knowledge, the thoughts and the Buddhist belief from the Buddhist palm leaf manuscript entitled, Paed Muen Siphan Khan. The palm leaf manuscript is not only the text recited, in the ritual, but also the source of the concepts in inventing the ritual objects and the ritual acts performed in this new Buddhist ritual. Moreover, this Buddhist palm leaf manuscript provides a symbolic meaning in the sense that it is the symbol of virtue and sacredness of Buddhism. This paper aims at examining the maintenance of the identity of the “Chong” ethnic group in Trat province in the Song Nai Ban Ritual at Ban Thung Kai Dak, Amphoe Mueang. The study reveals that the Chong, an ethnic group in Trat Province, has a significant ritual called “Bun Song” or “Song Nai Ban”, a spirit worshiping ritual that shows the Chong’s maintenance of identity in the following aspects: 1) the spirit food offering that indicates the relationship between the Chong and their ancestors; 2) the summonsing of wild animal spirits that expresses the relationship between the Chong and the forest; 3) the battle with spirits that reproduces the Chong’s narratives of war; and 4) the ritual space and the Chong’s territorial declaration. All of these aspects bring about an attempt to maintain the Chong’s identity and their harmonious engagement with the generation of today. อนึ่ง หลายตำนานยังกล่าวถึงพระพุทธรูปที่ไม่สามารถสร้างสำเร็จได้โดยฝีมือมนุษย์ พระอินทร์จึงต้องจำแลงเป็นสล่ามาเพื่อช่วยเหลือให้แล้วเสร็จ ตำนานลักษณะนี้เป็นทั้งความพยายามในการอธิบายว่า เหตุใดพระพุทธรูปองค์ที่ถูกกล่าวถึงในตำนานจึงมีพุทธลักษณะงดงามเป็นพิเศษ และความพยายามในการสร้างความศักดิ์สิทธิ์ให้แก่พระพุทธรูปในฐานะ “วัตถุศักดิ์สิทธิ์” ซึ่งสร้างโดย “สิ่งศักดิ์สิทธิ์"